Justin Zabor of Justin Zabor Enterprises and Zabor Funeral Home in Cleveland, Ohio talks about his presentation, Marketing & PR: Media Buzzing Made Easy. Then he turns the tables on Robin Heppell and asks about his presentation, Web 2.0 – the Future of the Internet. Dan Katz of Dan Katz Inc. in Northridge, California will be presenting, “Preneed Marketing: What they didn’t teach you in Mortuary College” at the 2008 ICCFA Annual Convention. Interview by Funeral Consultant, Robin Heppell. Dan Isard of the Foresight Companies presents, “A Sales Souffle Without the Sweat” at Funeral Plans Canada’s 10th Annual Sales Conference. For more pre-conference interviews, see the list of presenters – FPC 2007 Presenters. A Special Announcement for readers of the Funeral Gurus! On the heels of our request for those who seek new opportunities for public relations and networking, I have received an offer from marketing guru, Michael Port to invite my colleagues to attend his free seminar. 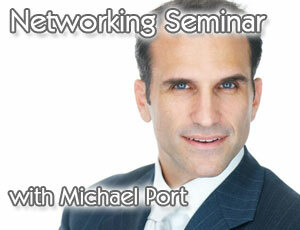 Michael Port is the author of “Book Yourself Solid” and has be called a “marketing guru” by the Wall Street Journal. Michael Port has lectured, trained, inspired, and provided coaching and consulting services to over 20,000 business owners in the last two years alone. As a speaker, he has headlined events with leaders like Tim Sanders, Carly Fiorina, and Tony Robbins. Seminar: Want to connect with top authors and with the most successful leaders in your community? How to spread your message and attract more clients Michael’s 2nd daily networking strategy is one that you can do in less than 10 minutes a day. Come learn exactly what you need to do in that 10 minutes to transform your network and your business. Even though this is not a funeral-specific seminar, I am positive that you will gain some great pointers for networking seminar – I will be attending the seminar for sure! Robin Heppell of Heppell Funeral Solutions presents “Google, YouTube and Your Funeral Home” where funeral directors will learn how to promote their funeral homes on the Internet beyond their own website as well as creating preneed leads once they get the visitor’s attention. Interview by John Welsh of Funeral Plans Canada. For more pre-conference interviews, see the list of presenters – FPC 2007 Presenters. Ron Downey – Total Performance Ltd.
For further information, please contact Tina Dietrich at 1-888-428-4444. The registration deadline is November 12th. Funeral director George Darte III, of George Darte Funeral Home, St. Catherines, Ontario, explains how he has transformed his funeral home’s selection room from just casket displays to a retail experience where families and friends can purchase sympathy cards, keepsakes, and many other memorialization items. Interview by Robin Heppell of FuneralFuturist.com. Ron Rosenberg of QualityTalk Inc. presents “The Inner Secrets of Outrageous Marketing.” For more information about Ron Rosenberg and QualityTalk Inc., visit the website at: www.qualitytalk.com.